Key Technology FAICS --- Fast Activate In Cold Sleep system & coordination of Micro-ampere WIFI heartbeat connection technology & P2P. 15-20 times triggered /Day,1 day under direct sunlight in a week averagely,live time service! -- Built in high capacity lithium battery. Charging by Mono-crystalline silicon solar panel. -- Built in 16G TF card, 110°wide angel lens. -- Day Night Vision 10 Meters IR range. 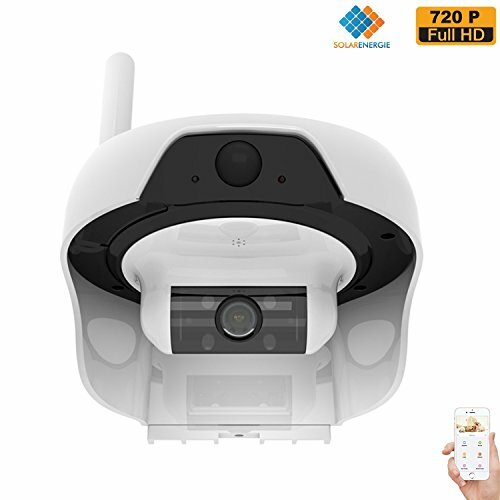 FalcoRC Solar Wireless WiFi Security Camera is suitable for Lot of Occasion with not too much people trigger the camera. • TRULY WIRELESS with SUNLIGHT POWER: The FREECAM C310 Solar WiFi camera charges its batteries with solar energy. High efficiency solar panel recharges internal large capacity Lithium battery for up to 30 days recording with only 5 days of direct sunlight exposure. The IP55 water resistant technology allows it to withstand heavy rain. It can be mounted anywhere outdoor around your house, store, factory or any place with sunlight and WiFi signal. This is a truly wireless security camera. • NIGHT VISION and PIR MOTION DETECTION: The camera has built-in infrared lights that can reach up to 16 feet, providing 24/7 surveillance of the area. The PIR motion sensor automatically triggers camera recording when detecting motions within the monitored area, and sends alarm / notification with photos to viewer's remote device through Android or IOS APP. The sensitivity of motion detector can be adjusted fit your needs through the App. • ONE-WAY AUDIO, WIDE VIEW ANGLE and HD 720P RESOLUTION: The built-in microphone allows user to hear and record the voices and sound with the App. The 110 degree wide view angle provides security surveillance to a large area. The HD 720P wifi camera comes with built-in 16GB memory storage (can add up to 32GB TF card optionally). The easy setup APP allows you to monitor any place remotely through the internet via smart phone, tablet, or computer. • USEFUL TIPS: 1. Before installation, charge the camera for 6 hours using the USB cable included. By doing this, it will fully utilize the battery capacity and make the camera work longer without solar power. 2. When setting up the APP, the user needs to have an email to register. 3. This camera is NOT designed to provide 24/7 recording. Instead, it only records when motion is detected or the user activates it. 4. To avoid unnecessary battery draining, reduce the motion sensor sensitivity. • 30 DAYS FREE RETURN, 1 YEAR MANUFACTURER WARRANTY and US CUSTOMER SERVICE: You can return it within 30 days after purchase and receive a full refund. The FREECAM manufacturer provides 1 year warranty on parts and labor. If you need installation guide, we have one available on YouTube. Just search for "c310 solar camera" on YouTube, you will find the installation guide video easily. FREECAM USA Customer Service call center: (201)-934-1654. Working hours: Mon - Fri 9：00 A.M.--6:00 P.M. If you have any questions about this product by freecam, contact us by completing and submitting the form below. If you are looking for a specif part number, please include it with your message.